Two weekends into the new year, I’m already wondering if the weather will be this volatile every month. This crazy climate change must be wreaking havoc on birds. In between arctic blasts, I got up to the lake at Hamlin Beach State Park, where I found a very confused and noisy Red-Headed Woodpecker. Well, maybe I was confused at the appearance of this unexpected bird, but it was definitely noisy. Corey spent all weekend searching across Queens for birds to add to his year list. He didn’t find anything particularly spectacular but he did see quite a few species. 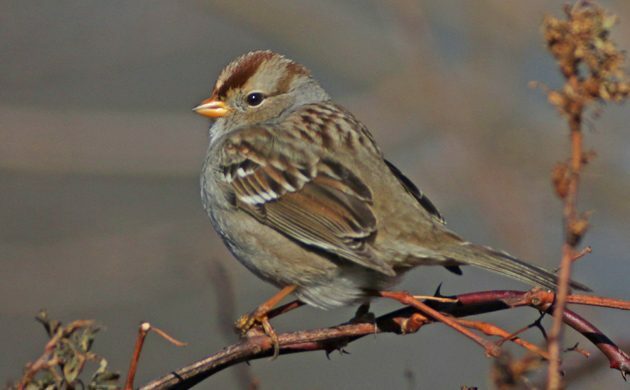 His Best Bird of the Weekend was either of a pair of young White-crowned Sparrows he found in Kissena Park in Queens, a good bird for winter in New York City! I was not really sure who might get the honor this week, until late last night. At 3:30 in the morning, a Great Horned Owl showed up, calling away, right outside my window. I got up and outside, just in time to see this shadowy night time species wing away from my window. Birds are utterly unimportant when you consider that I was actually able to see blue skies and direct sunlight for well over an hour on Sunday!!! Imagine that, true direct sunlight!!! That is so amazing! I guess if I sum up all the sunlight hours from the end of October to now, I won’t exceed 15. But on Sunday, I saw it! Sun on Sunday, hahahahahaaaaa!!!!! That’s a tough one. I actually had two favorite birds over the last week. The first was the first time I had ever seen a blue morph Ross’s Goose! Then, just yesterday a Northern Shrike.